Our sturdy plexiglas bottle rack holds ten 1/2 ounce bottles of color. 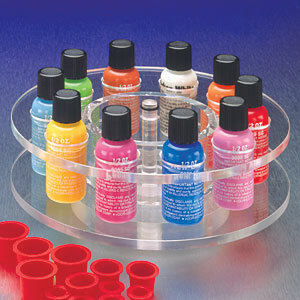 Comes with your choice of ten 1/2 ounce bottles of cosmetic color. Enter your color choices in the spaces provided. Please select from the colors below. You can see approximate color values by clicking here.